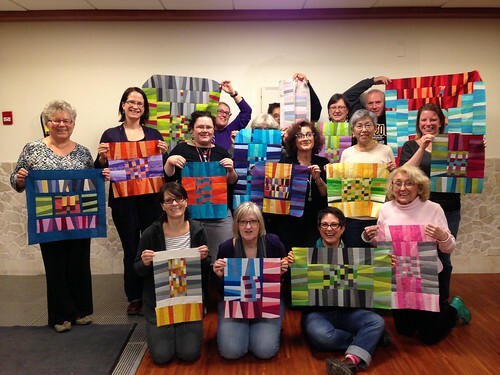 Last weekend I had such a great day with 16 members of the Vancouver Modern Quilt Guild! We got together for my Improv Under the Influence workshop. The 6-hour workshop is based on my free MQG pattern of the month (September) called "Chess on the Steps", however we make a smaller wall-hanging or table runner version in the class similar to my Temperature Check quilt. The supply list for the workshop calls for 10 FQ's of solids or shot cottons: five related warm and five related cool colours. For some people, the concept of "warm" and "cool" can be confusing, so I also suggest using a colour wheel to choose colours based on their relationships on the wheel. It is really fun in a workshop environment to see so many different colour choices, and how they work. Here is a sampling of student work from the class. In the middle are my little wonky trees I'm making for a holiday table runner with leftover sample chunks of improv-pieced borders (with Essex yarn-dyed linen in black for background). Here they all are with their work by the end of the day! I can't tell you how excited I am to teach this technique. It is perfectly suited for experienced improvisational patchworkers, but more importantly, it is a great intro into the world of improvisation for newbies. 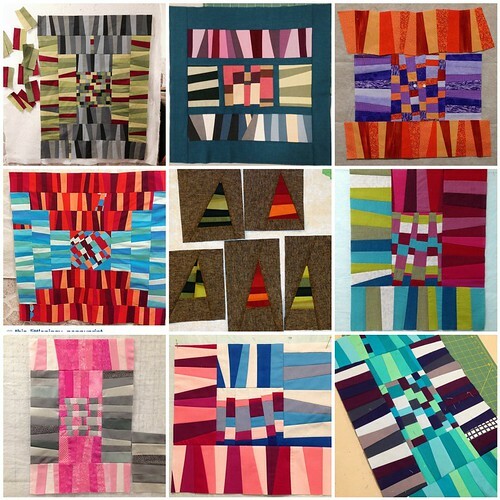 Traditional quilters wanting to try improv can do so in a supportive environment with just enough design structure so the process isn't overwhelming. The end result has a defined shape (a checkerboard surrounded by courthouse step borders) but there is also so much room to play and explore the relationship of the colour groups. You can see in the mosaic that some students decided to try a log cabin layout. This gives the quilt one diagonal set of "steps" where the two different colour groups interact, or touch each other. If you look at my Temperature Check quilt, you'll see that the warm and cool colours interact with each other on both diagonals and there is an impression that the cool colours are contained by those last borders of warm. I'm really enjoying working this technique through a series of my own quilts exploring different ways that the warm and cool colours can relate to each other. I'm booked to teach this workshop to several other guilds in the new year and I can't wait! It is also the class I'll be teaching on the Alaskan cruise June 7-14, 2015. By the way, there are still some spots on the cruise and Celebrity released a few more balcony rooms for our group. There are quite a few husbands coming along, too (not for the quilting, but I'm sure they'll find something equally fun to do while we sew on the "at sea" days!). Perhaps you and quilting friend are looking for an exciting getaway? It's not every day you get glaciers AND fabric. Join us! For more information, contact Lynn. Looks like a great class Krista, I recognize a few of the smiling faces holding up their pieces in progress. All the different variations look great! This pattern is on my list for 2015. P.S. I've gone on at least five quilting cruises--they are lots of fun and perfect for non-quilters, i.e., husbands! Loved my time learning from you, Krista! I'm booked or else I might come on that ship. Maybe next time. They all look awesome, maybe next year I should improv a bit more? Especially love Matt's on point centre. Those look incredible. 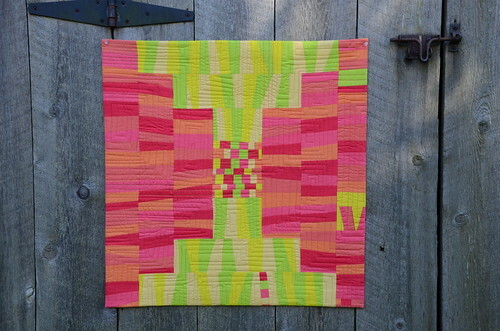 I love seeing the modern spins, the ability to really get the creative, individuality of a person into a quilt. I totally would love to take this class.